This article is from 2012 but I've updated and added some new suggestions since everyone can always use more money! 1. 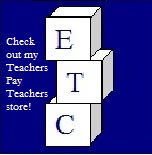 Sell your teaching ideas & lesson plans online. Although it might show I am a little behind the times, this is something I had never even realized was done or even thought about doing until this school year. However, it's been the most natural way for me to try to earn extra money over the summer. Sites like Teachers Pay Teachers and Teachers Notebook let you sell your lesson plans, worksheets, PowerPoint presentations and more online. 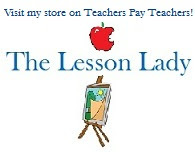 Teachers Pay Teachers even allows you to sign up for a free account and Teachers Notebook lifetime seller's fee is only $20 so it is a cheap business to start. I have found that I had to make some changes to some of my favorite lessons to make them work for others and I added some extra details, but thinking about different ways to teach things has made me a better teacher. The feedback from other teachers is also a big benefit. Last year I was looking all over online for an art game to play with my students. Now, instead of looking all over I knew I had the skills and abilities to make it and share it with others. 2. Work at a convention or other temporary summer job. One summer I earned extra money working at a few conventions that were in town. That worked for me since the Chicago area is large and has many conventions throughout the year. I found out about the convention work through an ad on Craigslist. The company was very understanding and nice and asked me to contact them the next summer if I was interested in work again. Now you may want a break from teaching since that is what we do the rest of the year, but you may enjoy teaching something different. Most park districts offer a variety of summer classes and I have found that if you call in advance with a new class topic, they are very open to new summer offerings. This would be a fun opportunity to teach something you don't normally get to teach such as garden tips or crafts and might refresh you. The park district near my house said that all I need to do was come up with a topic and they would be excited to add it to the curriculum. Tutor companies are always looking for teachers to help students during the summer or you could even start your own tutoring business. Tutor Nation is a great place to register as a tutor and advertise your services. Here is a good article about starting your own tutoring business with a lot of tips and things to think about. Pet or house sitting during the summer is a great way to earn extra money and still have plenty of time left to do other things. Pet MD has an article about starting up a pet sitting or dog walking service. If you have a hobby or craft that you enjoy, developing some items that you can sell on a site like Etsy is a great way to spend your time. If you enjoy photography, this would also work as a great way to earn money while having fun. 7. 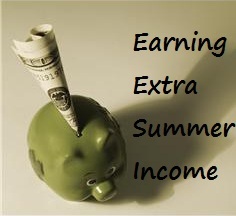 "Earn" money by becoming a super saver over the summer. This is not exactly a way to earn extra cash during the summer, but it is a great way to find yourself with more money during the summer and during the rest of the school year. The summer is a great time to start yourself on a budget if you are not already on one, look through all those bills and see if there are any you can eliminate or switch to different companies to save money. The biggest way I have "earned" money over the summer after starting it one year was couponing. I am not an extreme couponer like on TV but I learned the basics and couponing is something I can continue during the school year, although I am much more laid back about it. I follow Hip2Save's blog to find the best coupon deals and sales. Are there any creative ways you earn money over the summer? Please share your tips and tricks in the comments below.